Duernstein brings history alive. Some people say that this city shows a great story and shows the wealth of this region, like no other town. 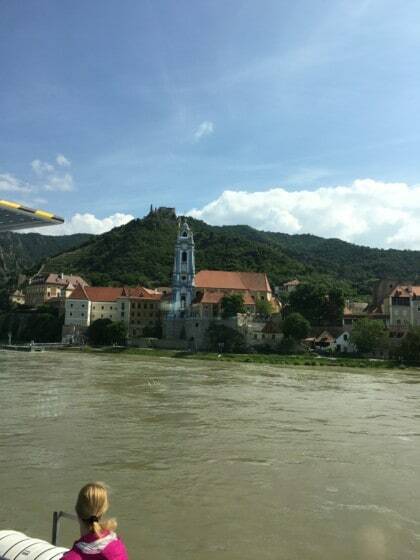 The Wachau valley is part of the UNESCO world heritage listed natural preserve in Europe. It is one of the oldest settlements in Austria, with a history of more than 30.000 years ago, when humans already seddled in this area. 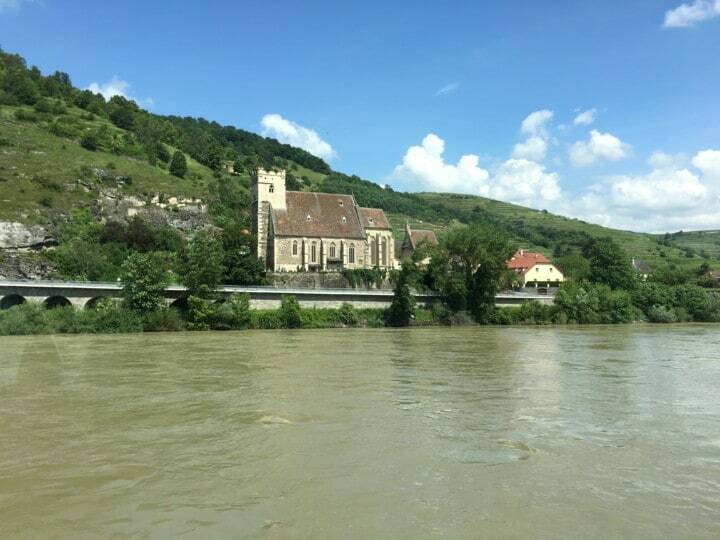 The Romans brought the wines to the region and since the end of the 1950ies the Wachau valley, is a protected wine region, with it’s own classifications for the wines. The wines are mostly white wines and are classified in 3 segments: The Steinfeder, Federspiel and the Smaragd (the most precious and most intense wine in this region). 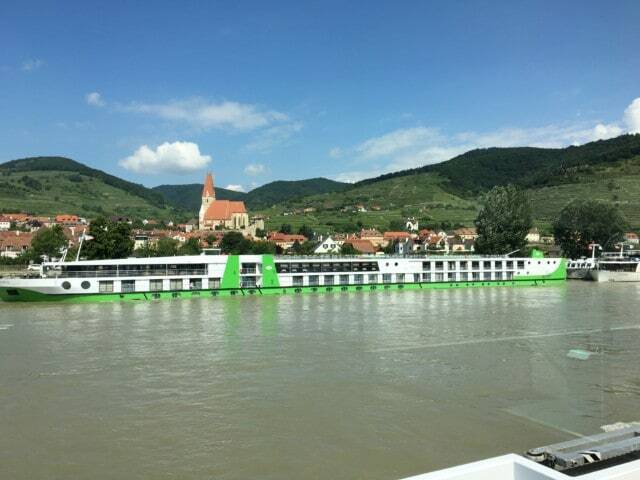 The Wachau Valley nowadays welcomes tourists form all over the world wit history, scenic valley and small villages with vineyards to welcome people from all over the world. 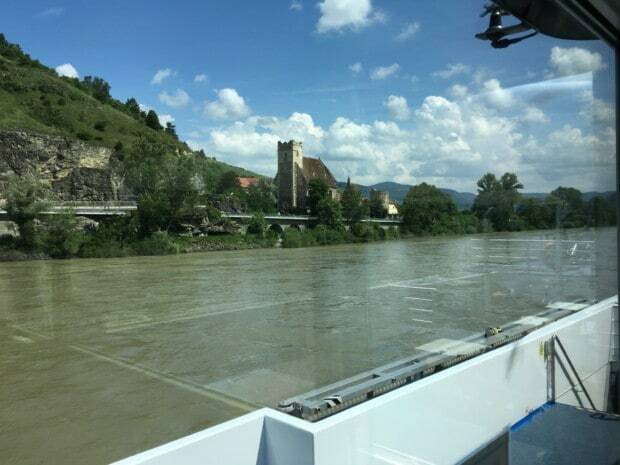 One of the best ways to explore the valley is to take either one of the river cruises, or explore it in the most comfortable way, on one of our glass roofed vans, or the a bike ride through this valley and make occasionally stops in one of the nice villages. The Wachau valley starts with the beautiful town of Melk and it’s abbey, goes then by the town of Willendorf, where a 4 inch high figure from over 15.000 years ago has been found, to Spitz and to the pearl of the Wachau valley – Duernstein to the town of Krems. 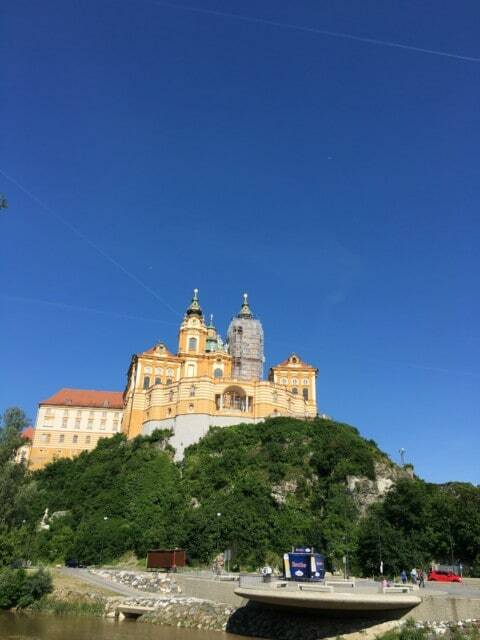 On the entry is one of the nicest abbeys – Melk and ends with an even more impressive abbey upon a hill – Göttweig. In the center is located this highlight town of Dürnstein, with a ruin of a castle on the top of the village and a very impressive church in the center of the village: It is one of the few blue and white churches in Austria and the color comes from a Meissen porcelain color which the emperor wanted to copy. This village is nowadays characterized by small and narrow streets, nice buildings and a very nice Danube promenade though the Danube curve and from where one of the nicest views of the Village of Dürnstein can be found. The original city wall and the medieval ruin of the castle make this village alive and shows how this village over the centuries developed. Nowadays in the village of Dürnstein some of the finest restaurants in Austria can be found. 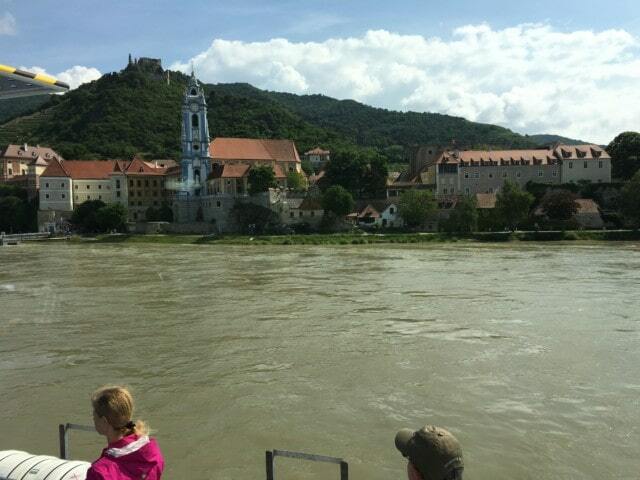 They make local cuisine and international cuisine into a harmony with the Wachau valley wines to a symphony. And Since the Danube has it’s own masterpiece of Music by Strauss (“on the blue Danube”), it shows how important this river was to the region. 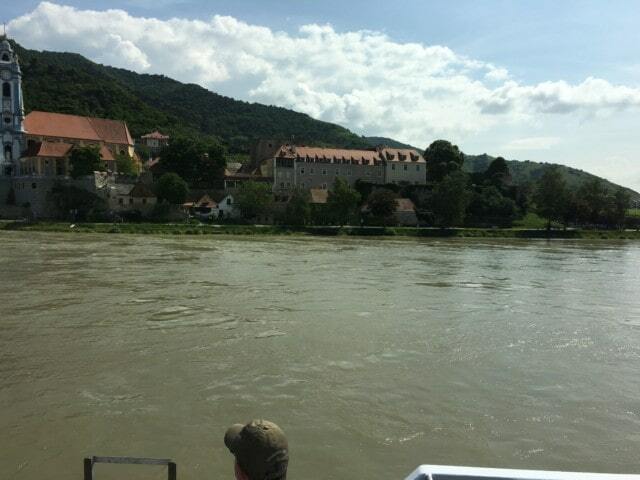 Unfortunately you will not find the Danube blue but you can follow Strausses’ footsteps by enjoying one or two bottles of excellent Wine from the Wachau valley and you will see the Danube blue as well. So please enjoy the village of Dürnstein to the fullest and see how this village combines tradition of winemakers, good food, history and nature into one big symphony of joy and good times. Above the city of Dürnstein you will find the ruins of the Dürnstein castle. Once upon a time a famous story has taken place there. Richard the Lionhearted traveled over land due to the fact that his ship was broke and he travelled also through the lands of the Habsburg’s dukes. Unfortunately he tried to pay in a pub with an english coin and his cover did not work any more. He and the duke of Austria were in a fight after Richard offended the Austrian Duke. Therefore he has been held in the castle of Dürnstein by the Habsburg duke of Leopold. He was the king of England and went in the 12century already for the third crusade. He was imprisoned nearby Vienna by Duke Leopold who accused him as being responsible of arranging the murder of his Cousin Conrad of Montferrat. Moreover Richard has personally offended Leopold by casting down his standard from the walls of Acre. Richard the Lionheart’s helper and singer Blondel, as the legend tells us went through all the castles in the Habsburg’s empire and sang under all of them a song which only Richard the Lionhart and Blondel only knew and Richard the Lionhearted answered to the melody and the text. Due to this legend there is nowadays a hotel and restaurant Blondel in Dürnstein. It is said that he tried to free his Emperor but only due to a payment of 23 tons of silver Richard the Lionhearted was really free and the money was used by the Duke of the holy roman empire. It is said that the ransom was used to fortify the city of Vienna and reconstructing the city of Vienna, building the city of Friedberg, Hainburg and founded the mint of Vienna which is still in use, even if nowadays only at printing the Austrian euro coins and euro notes. Besides those stories you can see this small village with less than 900 residents and the most important historical sights, like the court yard of the city hall. It shows an example of a mideval building, the Kremser gate one of the only existing city wall towers from the 15th century. In the west side you can visit some of the best examples of a medieval city houses and a church from the 13th century. the highlight of the visit will be a visit to the new castle/ palace. Built in the 17th century it is on the west side of the town, has two protective towers and with great windows over the Danube. In the 1960ies it was sold and transformed into a hotel which it is still nowadays with a great restaurant. Another highlight is the abbey of the clariss, which was founded in the 13th century, until they died out in the 16th century. Nowadays it hosts the hotel Richard the Lionheart. Dürnstein is nowadays seen as the “pearl of the Wachau” due to the history and as being in the middle of the Wachau Valley as one of the finest wine regions in Austria. After the second World war, especially within the German speaking area the town of Dürnstein was used to make many so called “home movies”. They were characterized to see the nice vacation destination and praise the city of Dürnstein as an example of a “problem-free” vacation destination and with good wines, nice girls and nature the perfect relaxing point. This has not changed and is still one of the things that attract tourists from all over the world. The clean and preserved nature, combined with thousand years old vineyards will fascinate you as well and combined with history make this pearl even blessing and blooming and will bring you the Austrian culture of nature, history and wines closer and you will enjoy it to the fullest. 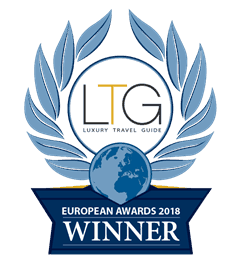 Come and find out yourself and let the stress out of the Wachau valley and enjoy the nicest nature, combined with history and a very good glass of wine. Dürnstein is nowadays not only the heritage of it’s own history but also part of the UNESCO world heritage listed Wachau valley. You will see also throughout the village lots of history where you will find the story of Richard the Lion’s heart still alive and see what this British influence brought to the town. See the architecture style and the vineyards surrounding this town to see how sometimes a prestigious pice can influence an architecture and being a symbol for the whole region, like this church, being a symbol of this region. Do not miss out to try one of the local vines and take the time to see also the ruins of the castle and the Wachau valley – history and fascinating stories of old times, history, nature and vines – b(e)specialtours! If you want to enjoy some great time in Dürnstein, book a private tour to Dünstein with B(e)special Tours from Salzburg, or arrive directly in Vienna, enjoy a city tour with our comfortable vans, enjoy a guided tour through the Wachau valley and continue a nice drive either through the Wachau valley, or Austria and see other castles and monastaries. So if you are planning to come to Dürnstein, or if you want to Visit the city of Dürnstein and the romantic road coming from Salzburg then please do not miss a nice ride with b(e)special tours! It is fun for youngsters and the older ones and you can taste a lot of delicious typical Austrian dishes and of course a lot of Wine! Enjoy the fascinating city of Dürnstein – Dürnstein and history – with fresh ideas, food and a lots of fun – b(e)specialtours!